Great feel and distance. One the of the best balls I've tried for the price. It sat on those fast greens real nice and distance was very good. The Inergel Tour is one of the best balls I've tried, distance is great, spin is excellent, they feel crisp and solid, and the best of this great balls comes in the green, it rolls truer than most and have this fell that make you putt better. The Pro Distance is a harder version of the Tour I didn't get more distance with these but they don't feel like the Tours. Go and buy the Tour you won't regret. Having read the last 5 reviews, i can only say "Jesus, are we talking abt the same ball here?". The innergel has been discontinued by Taylor Made, and rightfully so, if it is such a good ball why wouldn''t they want to continue with it after having discovered the ''magical'' substance. It has normal distance, normal spin, normal roll...i mean for half the price you could easily get other balls out there which perform to the same level as the innergel. What i am saying is, it is not a bad product, but it has nothing special to justify the price. It''s a plain, normal performing ball for people who would pay $20 extra just to have the taylor made logo printed on it. All Strata balls. Nike Tour accuracy, Maxfli Revolution. Great feel and spin. First time I put it in play, I got it close to the pin. Still has not disappoint me. The distance seems good with my slower than average swing speed. I like the looks and the container it comes in. My friend and I rave about. Too bad it scratches quickly. It was kind of pricey but since then the prices have come down some what and cover has changed. Taylor-made has come out with new balls. Hope it is an improvement on these. I went 140 rounds without a birdie from the time I started playing golf to the point in time when I purchased the inergel balls. In the next 3 months I have 5 birdies on 3 par threes and 2 par fours. They are a bit costly, but if you were to purchase them from K-mart, the price is actually comparable to that of most balls. I have since switched to other balls, and have been on a drought of birdies again, but soon I will have a job that will allow me to use the inergel balls again. to bad taylormade are taking these off the market, you can't go wrong with either model, but i have been playing the tour model and this ball will elevae your game. 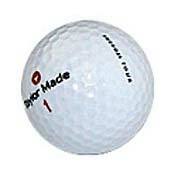 this ball will jump off your driver and will give you great distance, the ball will give you a soft feel off the irons. from 110 in this ball will land soft and check up on the greens. your putting touch will probably increase. my opinion is buys these before there gone. The reason I decided to try these is because of the price. I got overruns with practice on the side. They were $8 a dozen. You can't beat it. This is a very good ball. Not very long though. It has great control and a soft feel to it. It didn't last that long. I almost got 18 holes out of one. all in all, a decend ball. Well, I bought these balls at my local shop because I always wanted try them, being a TM fan. They hade bagged logo overruns (the balls say "practice" in very small lettering on one side) for $10/doz, so I bought 6 or 7 doz, since that's ludicrously cheap. I have used up about 4 doz since March (I play 36-54 holes per week), and I have to say I really like them. They don't do anything spectacular, but they fly a good distance (and pretty straight) and feel nice off the putter. They don't spin much into the green or check up on chips, but they are very predictable. My complaint is that the cover scuffs way too quick (2 holes on avg). I would say at $35 a doz they are not worth it, but they are as good as anything out there at $20-$25/doz, except the Srixon Hi-spin, which is awesome at $20/doz!! It appears that there are more of these logo overruns on ebay, and my shop still has bunches, so at $10 a doz I will keep using these unless I am playing a course with really hard greens. A good ball, especially for mid-hi handicappers looking for a forgiving ball with good feel. Value rating reflects retail price. I like this ball, I seem to be getting more distance than with some others I have played. I got a dozen for $20 at Sam's of all places. I doubt I would shell out the regular price of $35 a dozen. The cover did tend to cut a little more easily than other balls I have played. On almost every drive I was picking bits of cover out of the grooves of my driver, and always on my short irons and wedges. I didn't care for the shiney logo on this ball.